Dog shows have been around for a long time; yet dog showing is largely a self taught skill. Rank amateurs must compete against seasoned professionals and the skill is that imperceptible something that enables a good handler to make the most of a dog. We put a lot of effort into presenting our dogs to the best of our ability and if we are doing our best we are working our dogs in the show ring the same way as those who practice water and draught work. It is part of developing the bond between dog and handler as well as a good day out. Winning isn't everything, it is just the icing on the cake. However, disheartened by what sometimes seems a mysterious club, new exhibitors who cannot find help, give up. A good starting point is ringcraft. OK, where is the ringcraft class? Can I just turn up, what happens? The national dog papers are Dog World and Our Dogs. They are full of dog news but in the back few pages you will find the list of shows due to be held over the next couple of weeks plus adverts for other shows, or try an internet search such as "dog show uk". Look for a venue near you, often a sports centre and go along, anyone can go in and watch. Around the hall will be free schedules for upcoming shows, like the one you are at, they are hosted by canine societies who also run ringcraft classes. These are open to all but if you want to join the society all you have to do is pay the membership. Usually once a month and often in a local church hall they have their ringcraft/match, anyone can turn up and there will be practice first when those who want to can have a go. Someone will explain what to do, how to stand, how to move etc. and you and your dog will enjoy meeting all the other dogs and learn valuable skills along the way. Unlike other events, under age puppies (less than 6 months) are very welcome once their injections are finished and if there is a match meeting with an invited judge the babies get their turn too. No one is criticising, some will be novice handlers and some more experienced with novice dogs. Pay close attention to the junior handlers who are often a joy to watch. So now you know where to start and if you have fun and want to enter a show look again at the schedule and in the middle of it is an entry form. This looks scary but don't worry you'll do far more terrifying things before you have finished. The form confirms that the show is held under Kennel Club (KC) rules. A Novice aiming eventually for Crufts should stick to KC licensed shows. 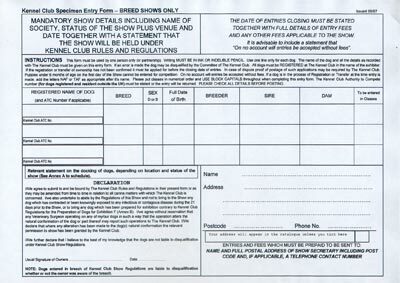 The licence should be displayed at the show and the Schedule should state the show is Licensed under KC rules. A dog may be disqualified from ANY award if proved to have been exhibited at an unrecognised show. It is not a bad idea if you have access to a copier to make yourself a blank since at some point you will make a real mess of an entry and have to do it again. You should use a separate form for separate owners but different breeds can go on the same form. This is because ALL the owners should sign the form. A recent innovation is internet entry when of course the form is not signed at all although the person submitting the form should be doing so with the permission of all the owners. I still find it easier to write out the form before tackling the Internet. Write as clearly as you can. A printer will have several hundred forms to decipher and bad writing can lead to some hilarious mistakes. Start at the Registered name of the dog in the body of the form. Get out your Kennel Club registration. When you are an old hand you will know the details by heart but to start, have them in front of you. It is an automatic disqualification if having won it is noticed that the dog is entered in details other than those recorded at the KC and this includes date of birth. NAF is "name applied for" and TAF is "transfer applied for". These mean the forms have gone to the Kennel Club but the registration has not yet been returned. Should this be the case enter the dog's name and write NAF or TAF or both after it. Firstly puppies under six calendar months are not eligible and more important are not allowed within the precincts of a licensed show (recent rule changes allow puppies from 4 months not for competition if the show committee approves). Look at your schedule and see if there are any classes for Newfoundlands. If there are you MUST enter the breed class unless you have a puppy and there are no breed puppy classes when you can enter the AV (any variety) puppy instead. The top of the form says this show is not on the group system but be aware that in group shows only the best of each breed plus the best Any Variety Not Separately Classified (in our case AVNSC Working) is eligible for best of group. So in this case don't go for the variety classes judged just before Best in Show, instead of AVNSC Working. 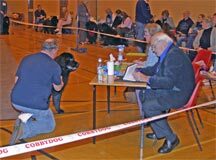 You can enter them as well as, to get the opinion of the best in show judge as well as the breed judge. The classes are defined in the schedule so take care that you NEVER enter a class for which you are over age or over qualified which means keeping records. Can you enter a 'higher' class? Yes, of course you can. However, puppies are babies and will struggle for place against older dogs. Should you be entering a Championship show the only qualifiers for Crufts are places 1 to 3 in Minor puppy, Puppy, Junior, Post Graduate, Limit or Open. As the bands stand for this year a 1st place in Limit or a 1st, 2nd or 3rd in Open gains your dog a KC Stud Book number and a lifetime qualification for Crufts. So you have to consider which class to enter. I will discuss the etiquette of Championship shows later, so now consider open shows. If you want to move up say to the Open class decide by looking at the dogs in your class and then look at the maturity of dogs in higher classes and when you won't look out of place it is time to have a go. Not all the dogs in the higher classes are there because they CANNOT enter the lower classes but because they chose not to. However bear in mind that puppies and to an extent juniors are forgiven some waywardness as babies. In the Open class you and your dog are expected to know what you are doing. Can you enter more than one class under the same judge? Again, yes, but in second or later classes you are a 'seen' dog and will be stood to one side and probably only asked to move up and down the mat which isn't a lot of practice for either you or your dog. Try to avoid going through all the classes from puppy to open. Try instead one breed class and one or two variety classes under the best in show judge. Should you get best puppy in breed you can withdraw from the variety classes to remain unbeaten for best puppy in group/show. YOU CANNOT WITHDRAW FROM A BREED CLASS unless you do not intend to take any further part in the show. (i.e. if your dog is lame or unwell). Now you have chosen your class put the number in the end column. It is not a bad idea to write the class next to the class number in case you have made a mistake or the number cannot be read. Looking at the breed name, the declared age and what you have written against the number should help the show manager or printer sort out which class you meant to enter. Don't worry we've all done it! To quickly finish the entry form, READ the declaration and sign and date it. Fill in your name and address and confirm if they should be printed or not and finally fill in the top of the form with no of entries etc., order a catalogue if you want one and make out your cheque to the SOCIETY not the secretary. Make sure you post the entry before the closing date as late entries can be refused. In practice, some societies are lenient about closing dates. There are instances where you arrive at a show and they have no record of your entries and unless you can prove they were sent and in time you may find you have to go home. It is a common practice to send a s.a.e. to championship shows due to the distance involved. Open show being local it seems overkill. When you get to a show always check in plenty of time that you are in the catalogue and in the correct class. Borrow a catalogue if you didn't order one. Any problems should be referred to the show secretary and if your entry was correct on the entry form and therefore a printer's error there should not be a problem. I'll discuss what to do in more detail next time because if, dear reader you are not losing the plot, I am!! The true winners are the ones who go home from the show without a rosette but with a true canine friend. Enjoy your walk in the park or a swim in the river, look at your dog sitting at your feet (or for the brave on your knee) and imagine what life could be without the best dog in the world. The winners cannot imagine deserting such a friend because it has cow hocks, light eyes or its bite isn't great or it doesn't move with a level back. The winners know the true worth of a dog is not the ribbons it collects but the love it gives and elicits from you. Your dog knows its job is to love you and be part of your family, don't let it down.